This year has been one of the most amazing years filled with so may blessings. It should be so easy for me to type this blog post but honestly, it is super difficult. Not because I don't have a lot to write about but because I have been the busiest and exhausted I have been in a long while! We closed on our new house in April of this year and since then I have been chauffeuring kids to and from school and their extracurricular activities, working on my new t-shirt line, selling milk paint, continuing with my furniture refurbishing business and decorating our new home. Not to mention all the upkeep and unsuspected maintenance we have had pop up in the last few months of home ownership. (If I had to count how many sprinkler heads I have had to replace, I wouldn't have enough fingers.) Imagining my crazy, busy year I think you can see how its been super hard for me to keep up with my blog, YouTube channel, and DIY projects. I have to say that the holidays were a blessing in disguise. 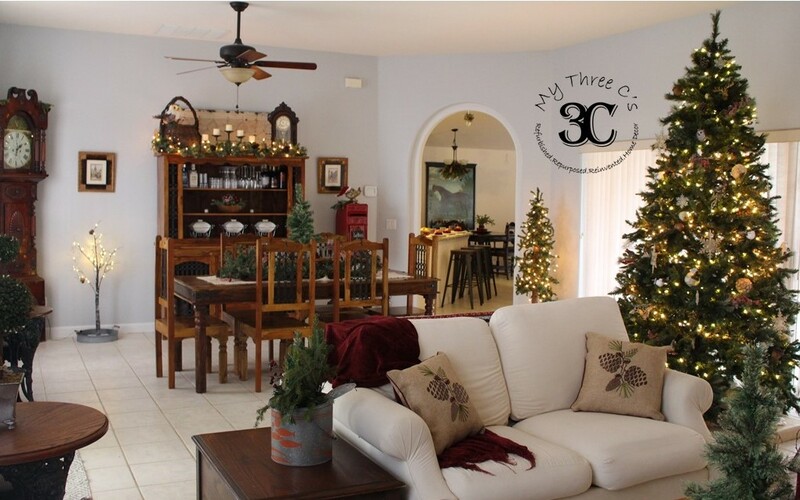 If it weren't for holiday guests I may have never found the energy to get my decorations up and get the house clean! In November, my husband told me he wanted to host his office Christmas party at our house and I was more than a little worried. I can be a little obsessive about entertaining (okay...a lot obsessive) and I just didn't feel like my house was up to entertaining a big group of people. For one, we moved from base housing which was a little over 1600 sq. ft. to a 2900 sq.ft. home. I had to find a way to decorate a bigger home, and accomplish it in a months time with very little money. I was worried because I didn't just need Christmas décor, but I was in need of furniture too! 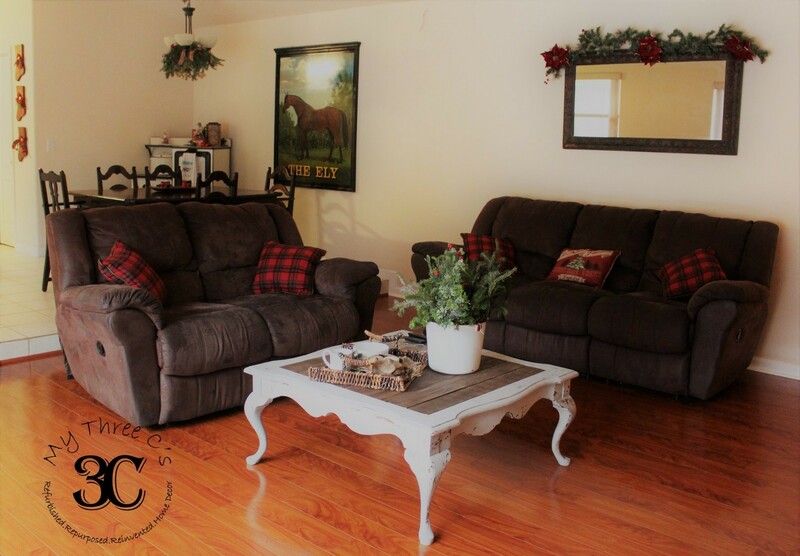 I had no sofa in our living room, I started but never finished painting our living room, I had no coffee table in our family room and our kitchen table was missing chairs. Instead of just giving up I decided to hop on Pinterest and peruse my favorite home décor magazines to give me some inspiration and direction. Once I decided what styles I liked and decided what items matched my instinctual home décor taste I took my very light wallet and hit all the local thrift stores on an almost daily basis. I found lots of Christmas and non Christmas décor embellishments but on one trip I found a very simple duck cloth loveseat and a great Queen Victoria lounge chair for a steal of a deal plus it was Veterans Discount Day!! I steam cleaned and dusted both pieces and you would have never guessed that I got them second hand. How's that for breaking the ice on this home décor mission! During this time my husband and I worked a little every week in our not so spare time to finish painting our spacious living room. It is quite a feat with 10 ft. ceilings. Especially since I am severely afraid of heights and climbing ladders get my knees knocking like you wouldn't believe. 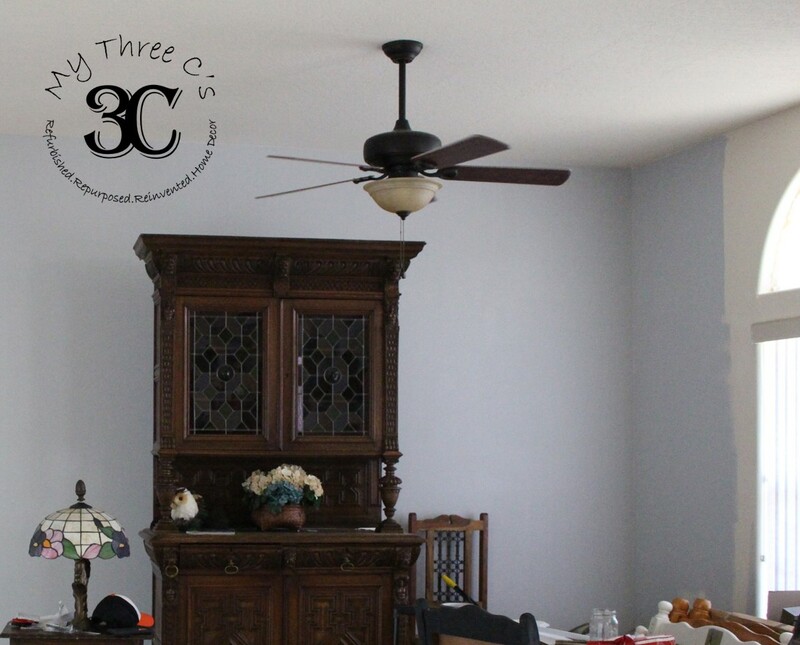 I painted our living room a soft and calming grey blue tone. I like to stick to blues and greys because of their Zen like properties. The paint we used was Behr Premium Plus Ultra Interior Eggshell Enamel in the color Planetary Grey. TIP: When you are talking about paint that covers great and has great stain blocking properties you get what you pay for. In my opinion, don't skimp on cheap paint. 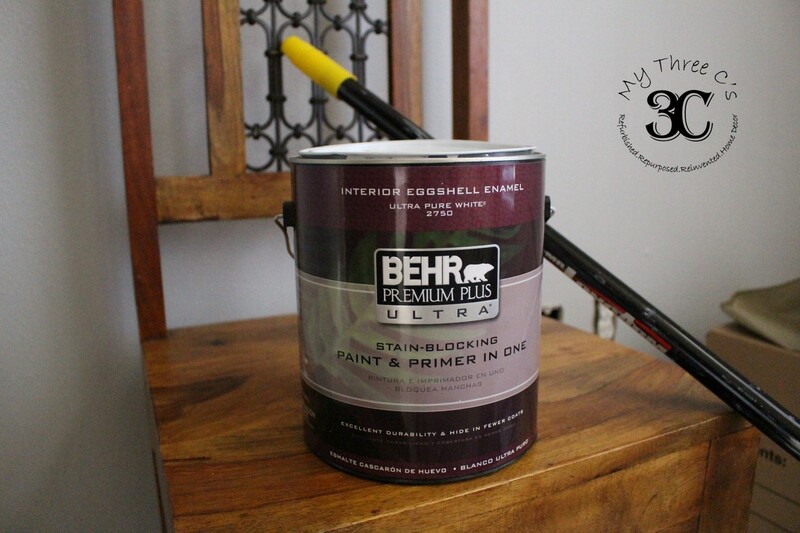 I have been a Behr girl for years and recommend it to anyone that asks. Here you can kinda see the old color to the right which was a vanilla"ish" beige alongside the new color. I cropped out the nightmare of a mess I had going on the living room floor. While shopping for décor at one of my favorite thrifts, I found a great clipper ship print. It looked so great on my blue grey walls that I decided to do a collage of ships with prints and paintings I found while junking. So far I have four pictures. You can see some of them in this picture as well as some of my Christmas décor. 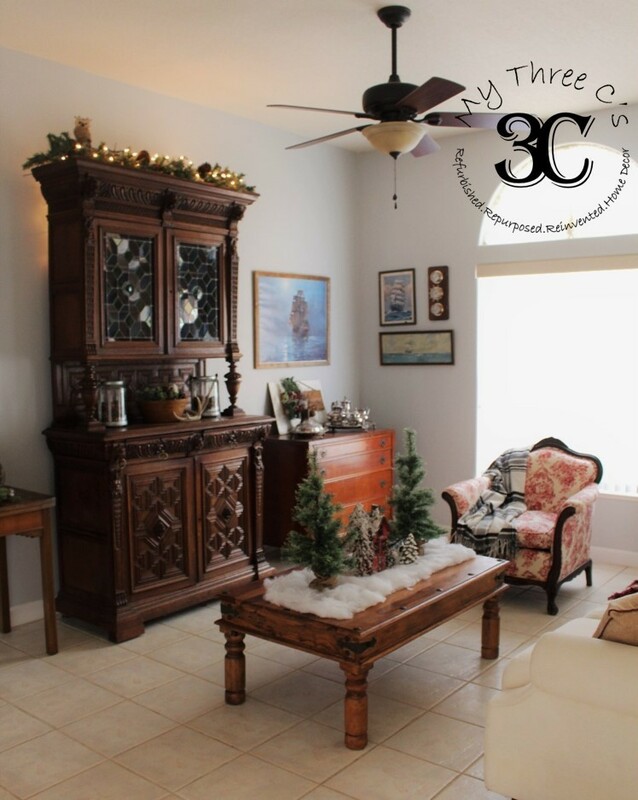 You can also see the Queen Victoria Lounge Chair in this picture. Not bad for a thrift store find! 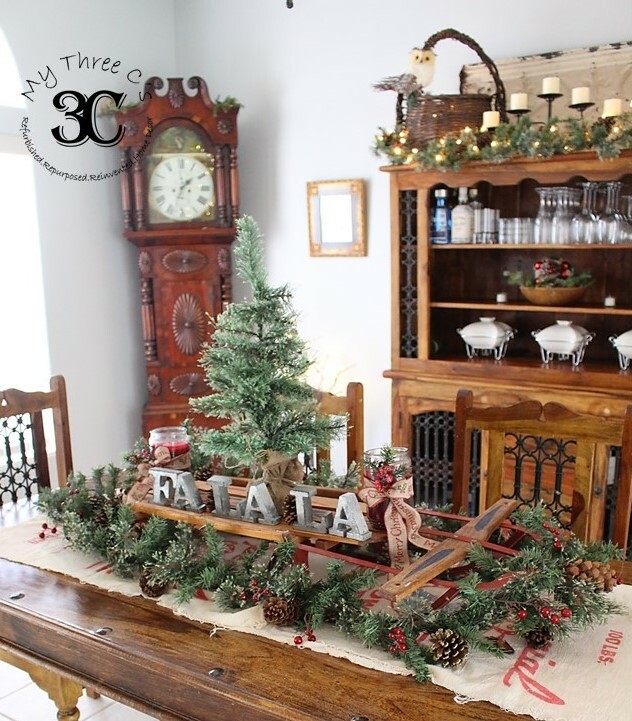 The Christmas décor you see here consist of junking finds, and last years bargain shopping. 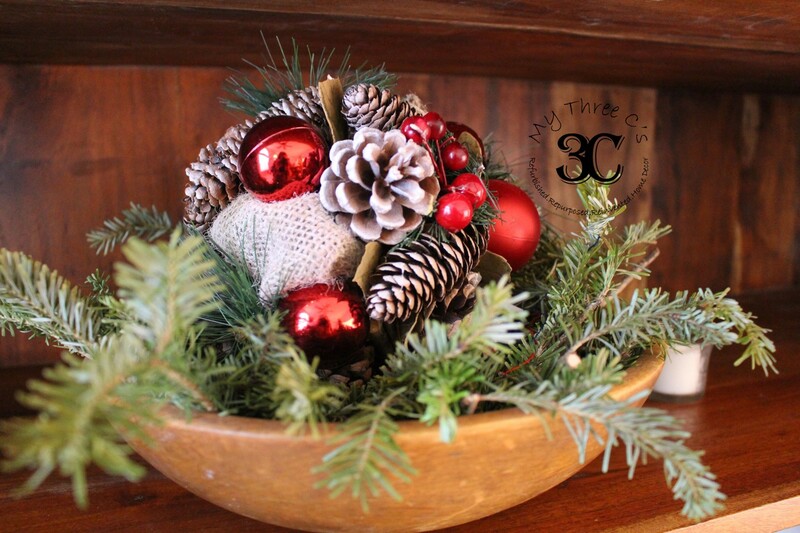 TIP: Visit the local craft and home décor stores the days after the holidays. Most stores are practically giving away their seasonal merchandise. Just pack it away, along with this years decorations and next December it will feel like Christmas came early! One of the best things about moving into a bigger house is unpacking things that did not fit in your last little base house. This stained glass European China Cabinet was one of those. I had this piece crated and stored for three years and I was so ecstatic to finally unbox it. 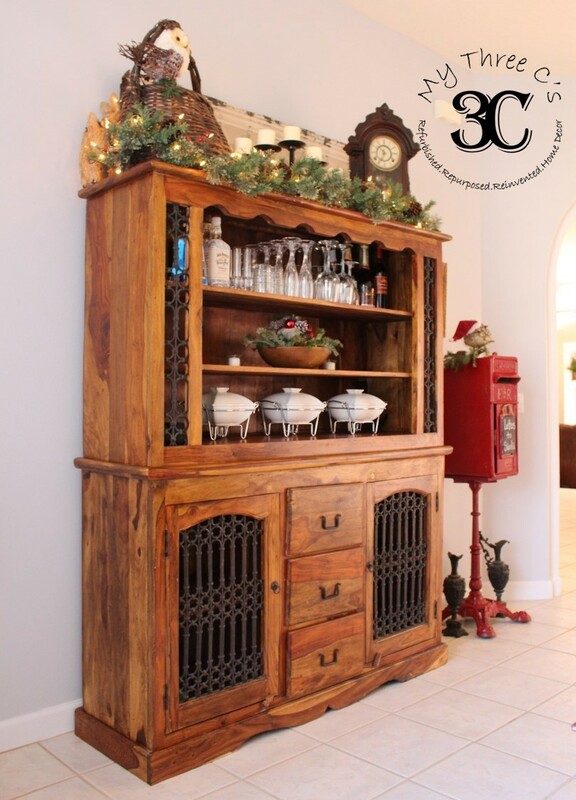 Some things just never go out of style and hand carved antique furniture is one of them! Wondering about that second hand sofa??? Well here it is dolled up with some cute pillows I picked up at Walmart. Speaking of second hand scores! See the 9ft tree on the right? Guess how much I got that for at Goodwill??? Did you guess $14.99? Well if you did, then you are correct! I spent weeks pricing trees and I nearly gave the hubby a heart attack when I took him tree browsing. Most artificial trees range from $170-$300 brand new. You better believe I pulled the tag on this bad boy and paid my $14.99 before they realized just how little they were charging me. It just goes to show that if you are patient and keep your eyes peeled for good deals, you can get lucky. 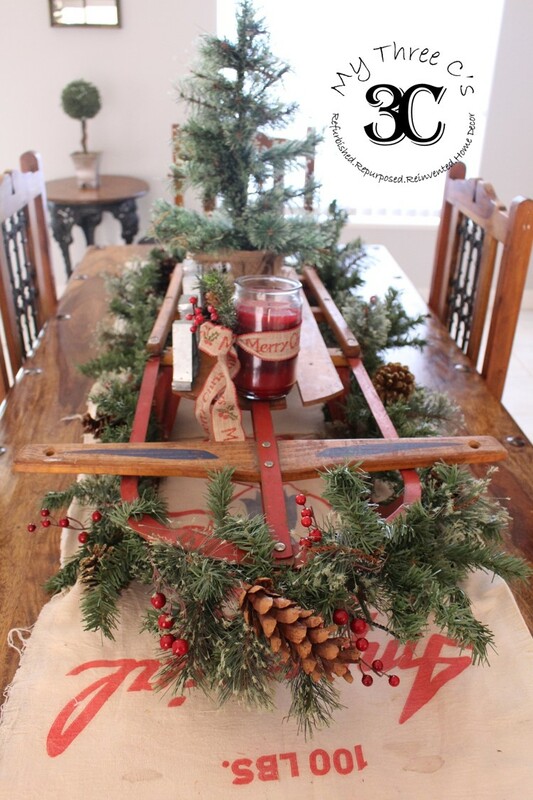 Finding a good centerpiece is always tricky, but nothing beats taking something unexpected like a vintage sled and some old, cloth feed sacks and using them to dress up your table. 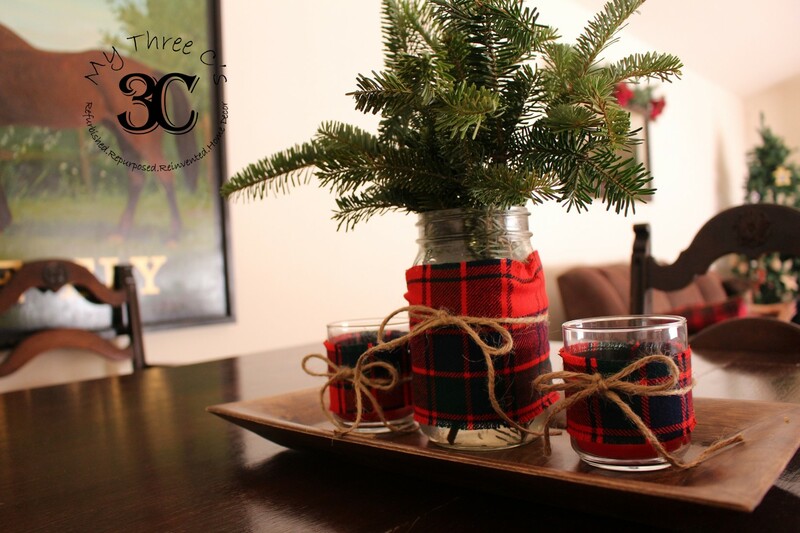 Add some galvanized metal, cinnamon candles, festive foliage and you are good to go! TIP: Buy your favorite scented candles, remove the manufacturer sticker and decorate it with some fancy Christmas ribbon and some greenery. I love Better Homes and Gardens Scented Candles from Walmart and the Ribbon and greenery are from Michaels! If you don't already have the Michaels app on your smart phone, download it after reading this blog! They have weekly sale items and COUPONS!!!! Because I wanted to be a good hostess I made sure to have champagne flutes and wine glasses on hand. I found these at Goodwill for .69 cents each and they are not the thin cheap glass. These glasses are heavy and makes it look like I spent department store prices. A little soapy hot water and they are as good as new and ready to fill with Christmas spirit. TIP: Save money on holiday foliage by visiting your local pop up Christmas tree tents. The workers will sometimes give you the clippings for free. Take a box, fill it up, and enjoy the pine scent and holiday cheer for days. 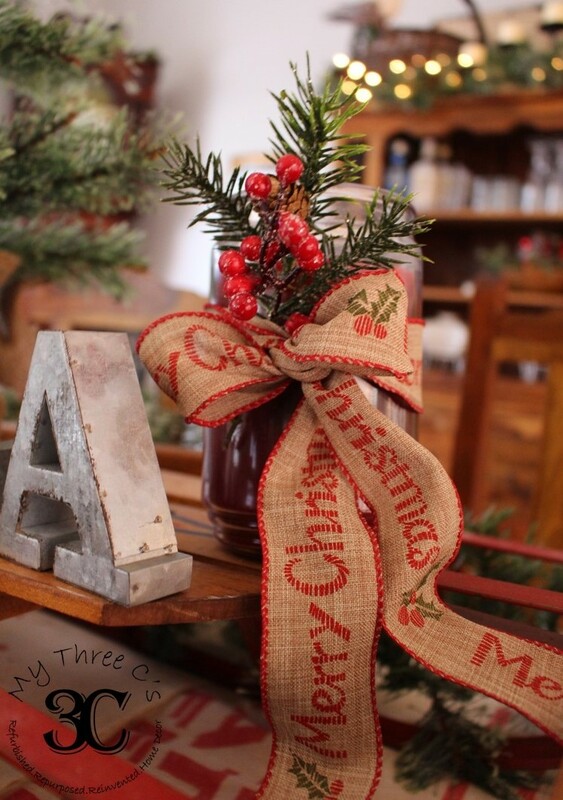 Use them to trim out centerpieces, fill mason jars or if you are super crafty, make wreaths. 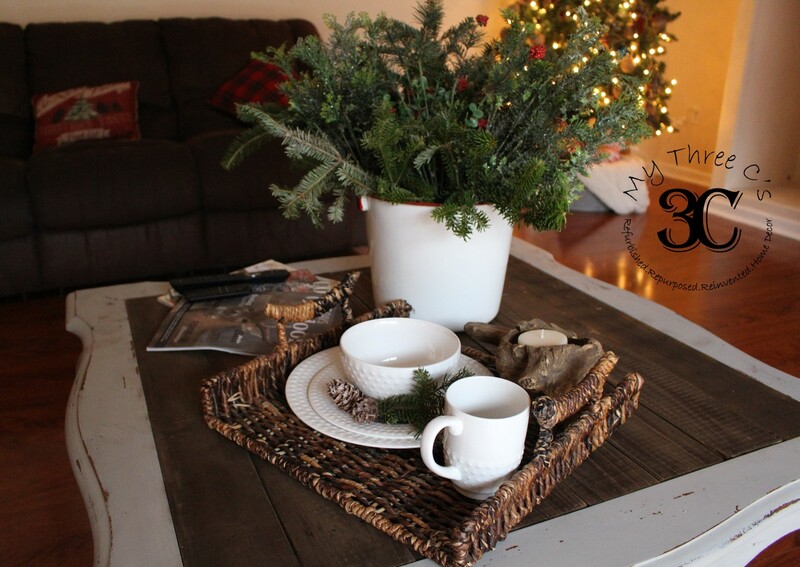 Here I took an old wood bowl and mason jars I trimmed with plaid and twine and filled them with my free clippings. 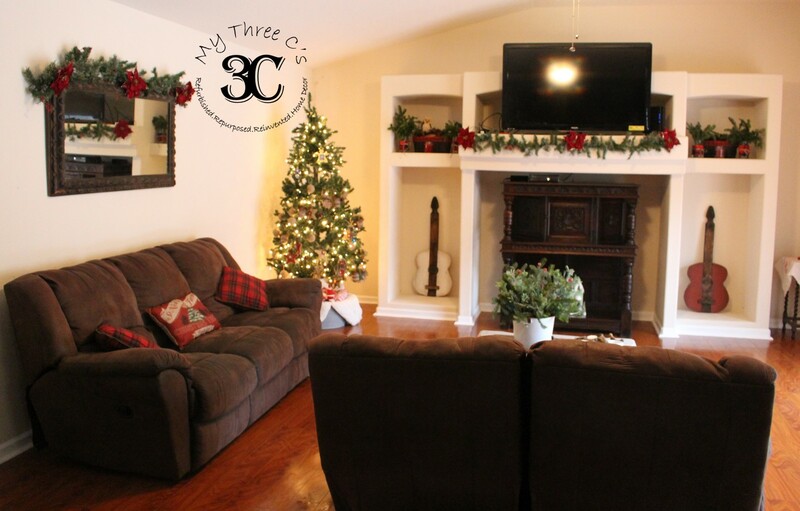 I spent a lot of time in my living room decorating but I also tried to show the same amount of attention to detail to my family room. With food and laughter on the menu I wanted to give people a comfortable place to mingle, nibble and unwind. 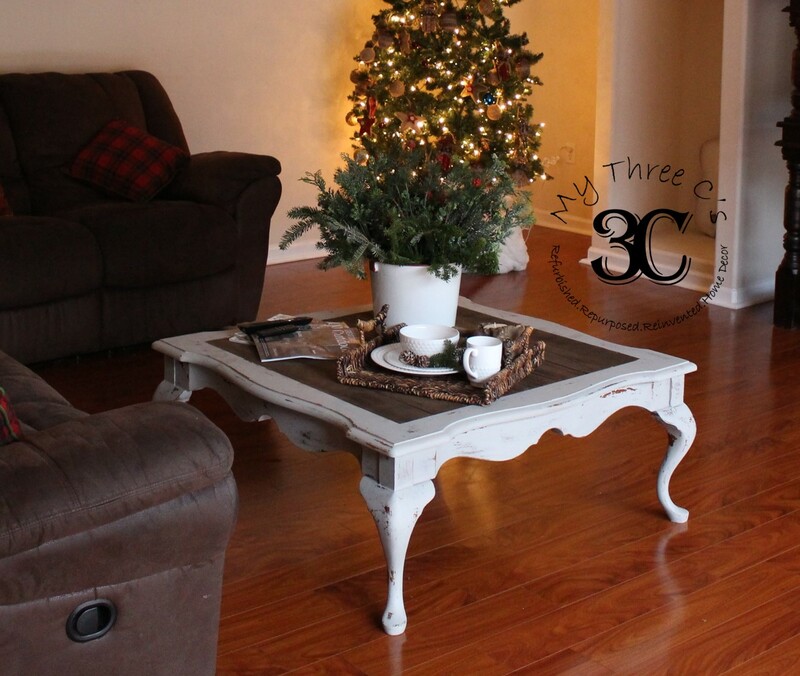 I had to find a coffee table that was big enough to fill space but matched my style and budget. I again hit the thrift stores and found two coffee tables. One didn't work with my décor so it was refurbished and put up for sale. The second one was big enough but it had a glass top. As a mom of three crazy boys I knew that would be a major no-no! 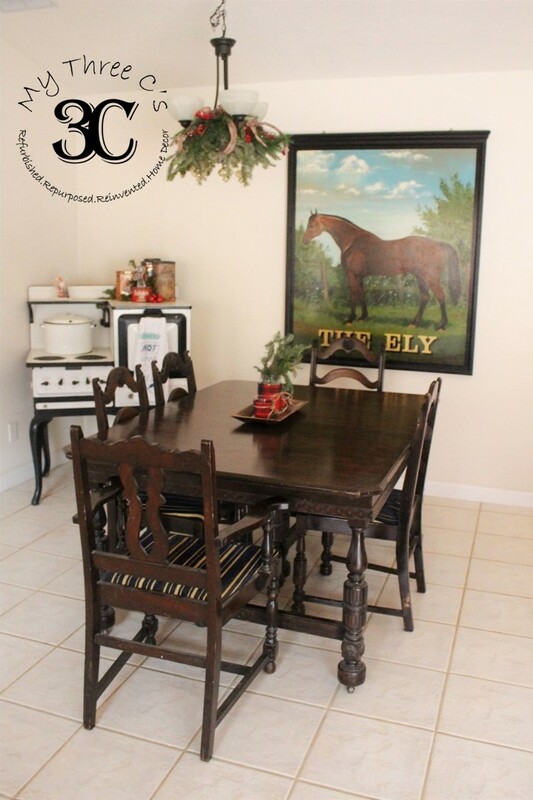 I decided to paint it with Sweet Pickins Milk Paint in Haberdash then I sealed it with our Clear Beeswax. I replaced the glass with reclaimed wood slats which I cut to fit, sanded, then stained. I have to say I am thrilled at how this project turned out! And here is how my coffee table looks with the rest of the space. 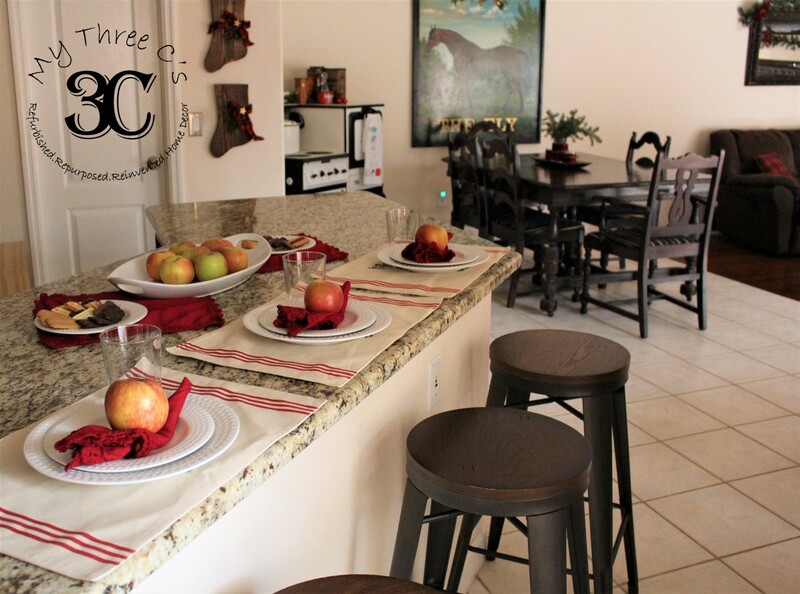 TIP: Use food for décor! Use a plate of cookies, a bowl of apples, or even tasty canapés on a fancy server. You have them on hand already, so why not serve up some delicious ornamentation. Last but not least my latest purchase! I bought this dining room table from a friend and fellow junker for a great deal! I plan on reupholstering the seats and giving it a makeover but I'm gonna have to save this for after the holidays! I still have to wrap presents and spend time with the family so I think it can wait. 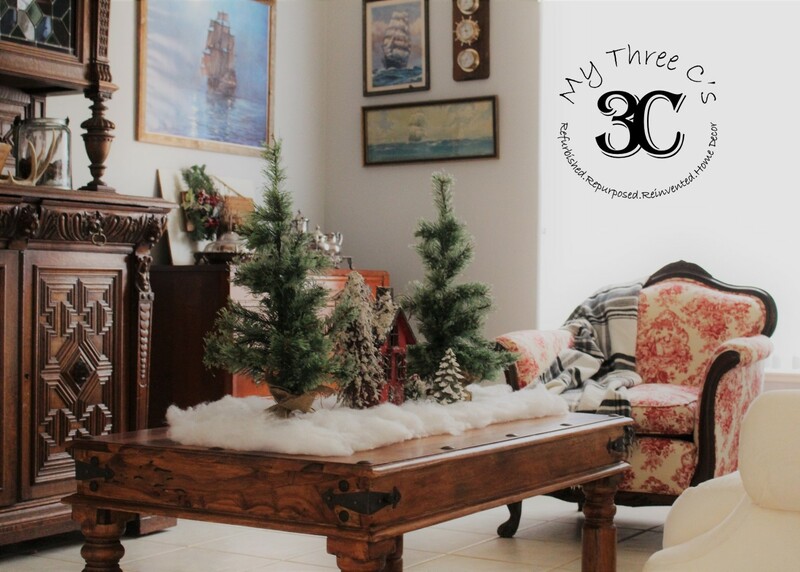 I hope you enjoyed my Christmas home tour for 2016. Hopefully I will be able to pick up my blogging pace in the new year. If you liked this blog, my tips and my photographs, please make sure to share on Facebook and pin my pictures! Until next time Merry Christmas to you and yours and Good Tidings for the New Year!